V+ is a light-up climbing wall designed for enhanced interactivity. Through a phone App the users can choose between different routes, which light up in different colors according to level of difficulty. 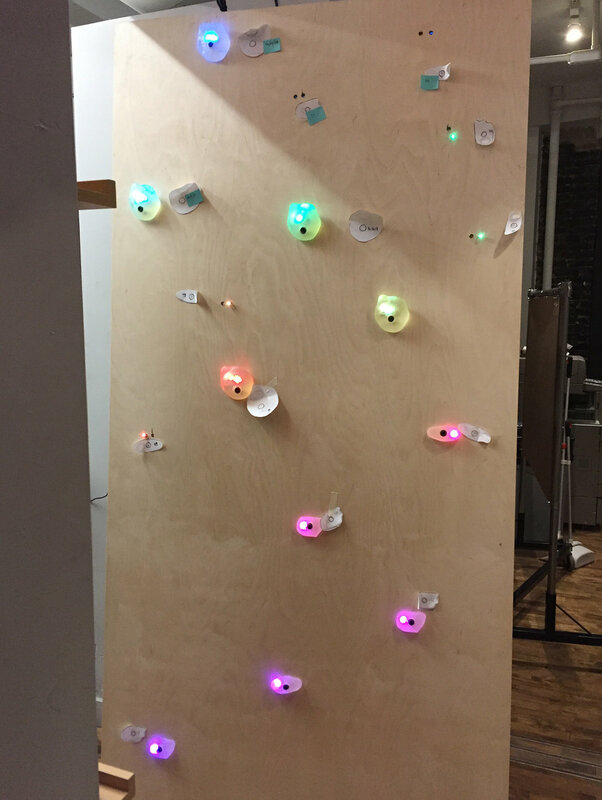 Through the Adafruit Bluefruit App, the climber can connect to the wall and choose 3 different levels of climbing. Once a level is selected the holds on the selected route light-up and oscillate between two colors, emulating the human breath and providing the climber with a rhythm to follow. Once the climber is ready to move up to the next level, it’s as easy as opening the app and selecting the next challenge. Indoor climbing gyms could feature V+ to bring in a different experince into their space and let climbers play on the wall in a dimmer setting. The interactivity is customizable, and could bring innovation opportunities for the route setters to explore. The project was inspired by Alexia's love for rock climbing. At one point she found herself at her local climbing gym thinking about how the wall could become more interactive. Climbers tend to gather around climbs to challenge each other, give each other advice and socialize. Could there be a way to light up the wall and get people to program their own climbs to share with friends and enhance the social and physical experience? V+ is the first prototype, but Alexia is already thinking of the potential of adding touch sensing to the wall for more interactivity. It could help climbers train by keeping track of their times and movements, even changing the climb if it seems too easy, or giving the climber queues on where to go next. The process of creating this first prototype started by molding and casting holds in Urethane Resin and testing the light behind them. Once the lights were in working order it was a matter of collecting all the right hardware, soldering the long circuit—keeping track of the order of the LEDs—and installing the entire thing on a full sheet of plywood for testing.. After the entirety of the holds were cast, finished and installed along with the lights, the focus switched to coding and programing (using Arduino), to enable the different holds to switch on and off according to the program desired.